This year, Central Florida Community Arts is proud to present $10,000 worth of scholarships to nine deserving high school seniors, as they prepare to begin their college careers in one of the following arts disciplines: instrumental performance, technical theatre, theatre, musical theatre, dance, vocal performance, or visual arts. 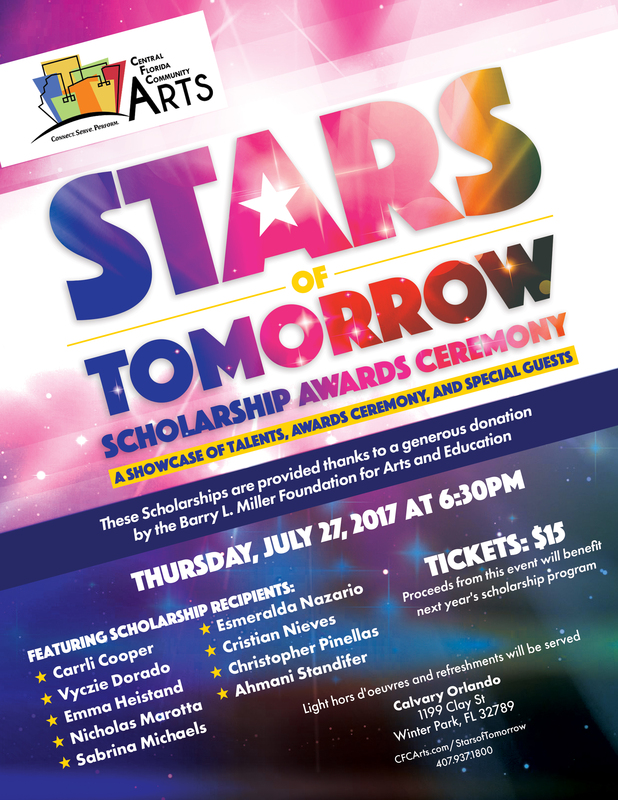 These scholarships are provided thanks to a generous donation by the Barry L. Miller Foundation for Arts and Education. Our scholarship recipients will showcase their talents for an audience of their friends, family and other supporters of the arts. The evening will include light hors d’oeuvres, special guests and an award ceremony, as well as opportunities to support next year’s scholarship program.